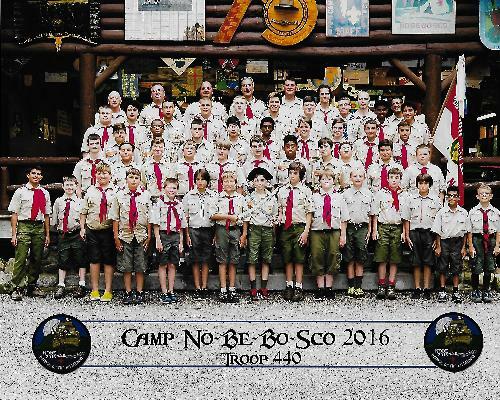 Troop 440 in Monroe, NY was chartered in 1970, and is sponsored by American Legion Post 488. Our current Scoutmaster, Mr. Jeff Manson, has been volunteering with the BSA since 2001. He has been a Den Leader, Cubmaster, Committee Member and Assistant Scoutmaster; becoming Scoutmaster in June of 2015. Mr. Manson and the entire Troop Committee strive to continue the troop's longstanding heritage as an active, outdoor oriented organization that loves to hike, camp and just generally have fun while fulfilling our objective of providing a wholesome, safe environment in which the Scouts can develop their individual strengths, and learn the skills they will need to become the leaders of tomorrow. Troop 440's activities are planned to support both our heritage and objectives. Our yearly schedule of events includes a winter camping trip to Trout Pond at Ten Mile River Scout Camp or the George Boos Reservation at D&H Canal Park, Skiing, White Water Rafting, Backpacking, Hiking, Fishing, Summer Camp at Camp No-Be-Bo-Sco and an entire host of other trips and activities. Our "home" campground is at Berry Road Park in Monroe. Troop 440 truly embraces the spirit of Scouting and has a loving respect for the great outdoors. Ramble around our site for a while. Browse through our photo galleries. Take a peek at our schedule of upcoming events. Drop us a line with any comments or suggestions you might have. And if you're ever in Monroe N.Y. on a Monday night, stop in to the Pine Tree Elementary Cafeteria and say "Hi!". We'll keep the fire lit for you.